Our Trusted Regina Auto Body Repair professionals at MAACO Regina tell us why Certifications matter. When you’re trying to find an auto body shop, comparing pricing alone is tough. You may end up with a bunch of estimates that are all completely different. How do you tell what you’re getting for your money? How do you choose the best auto body shop? One of the biggest things you should consider is their certifications. You want to make sure whoever works on your vehicle is properly qualified and trained. Certifications are one way to make sure both the collision repair shop and the repair technician you choose have been trained in the most current repair techniques and technologies available. Maaco Regina has gone to great lengths to ensure they are Certified in many ways. In addition to having been given the thumbs up by Trusted Regina. Here is a list of their certifications and some descriptions to explain why they are important and what they mean to you. I-CAR Gold Class Certification is a independent third-party certification process that is quite literally the gold standard for collision repair. That means this Center is extensively trained in the latest tools and technologies of the trade. I-CAR (The Inter-Industry Conference on Auto Collision Repair) is a non-profit organization dedicated to providing those in the collision repair industry with the knowledge and skills to achieve a complete and safe repair. Shops who achieve I-CAR’s highest level of training are designated as I-CAR Gold Class Professionals, considered the highest level of training in the industry. All ProFirst Certified shops are validated for their skill and expertise, commitment to a complete, proper and safe repair, to ongoing industry education, and to customer satisfaction. Each shop is validated annually by an independent third party to help ensure a high standard of repair quality. Honda is committed to providing safety for everyone, in the way Honda and Acura cars are built, and in the way they are repaired after a collision. The Ford National Body Shop Network program was created to promote Certified dealership and independent collision repair providers to Ford vehicle owners and insurers. The program will ensure that Ford vehicle owners can choose a Certified collision repair provider to return their vehicle to OEM specifications, and ensure the vehicle's fit, finish, durability, functionality, value, and safety are preserved. This is particularly important based upon the increasingly complex vehicle design and repair requirements of Ford vehicles. This new program allows dealers and independent collision repair facilities to meet the qualifications necessary to be certified by FCA Canada as a collision repair facility of choice for its vehicle owners. According to Certified Collision Care, the program will ensure that FCA Canada vehicle owners can choose a certified collision repair provider, that has the proper tools, equipment, training and facility required to repair their vehicle to OEM specifications and ensure the vehicle's fit, finish, durability, functionality, value, and safety are preserved. Assured Performance has launched the Canadian Certified Collision Care Program. This program provides complete national coverage of Certified repair providers - best in class businesses that have met or exceeded the advanced technical requirements to become officially Certified. With Canadian management and an inspector team that is trained, tested and trusted covering Canada, Certified Collision Care is rapidly expanding, providing critical benefits to the Canadian market. All accredited repairers are required to meet or exceed the highest levels of equipment, certification and training and must warranty the repair for a minimum of 1 year. There are 4 levels of accreditation for SGI-approved repair shops: Elite*** - Top level of recognition, exceeding SGI’s requirements for certification. Can perform vehicle damage estimates on eligible claims. If you are looking for a qualified Auto Body shop that is locally owned Maaco Regina. They are a Trusted Regina Auto Body Shop. Need to book your car in? Contact MAACO Regina today! Confused about what type of oil to use in your vehicle? Our Trusted Regina partner shares some insight. What type of oil should I use? Conventional, Synthetic, or a Blend? There are differences between the types of motor oil available to consumers. Here we try to provide information that will help you make a choice for your vehicle. What is the difference between regular and synthetic oil? Regular motor oil, also called “conventional” oil, is a mineral grade oil derived from crude liquid oil from the ground. It is created by a refining process. Synthetic motor oil is also refined from crude oil from the ground. However it is processed further than conventional oil is. Synthetic oil is distilled, purified and broken down into its basic molecules. This process not only removes more impurities from the crude oil but also enables individual molecules in the oil to be tailored to the demands of modern engines. What are the advantages or benefits of using synthetic oil? •	Synthetic lubricants protect better at any temperature. In the summer, your engine will stay cooler and therefore use less fuel. In the winter, the engine receives lubrication sooner than with mineral grade oil. At any temperature, when an engine is first started, a mineral oil takes some time to circulate, allowing friction between non-lubricated parts to cause wear. In contrast, a synthetic lubricant starts circulating straight away, protecting every moving part within the engine. This results in less metal-to-metal contact and thus extends the life of the engine. •	Synthetic oil keeps your engine cleaner. As oil circulates through your engine it can pick up deposits. Over time, conventional oils can sometimes form sludge, which can reduce your engine's efficiency and, ultimately, reduce the life of your engine. Sludge deposits can turn into varnish (sludge deposits that have hardened and coat internal surfaces) over time, thus synthetic oil helps protect against varnish as well. •	Use of synthetic oil helps to cut engine emissions when compared to conventional mineral oils. This makes them more environmentally friendly compared to regular oil. Conventional mineral oils contain greater amounts of impurities, such as sulphur, reactive and unstable hydrocarbons, and other undesirable contaminants that cannot be completely removed by conventional refining of crude oil. •	Synthetic oils can also significantly improve fuel economy and efficiency. During the warm-up period of a typical truck journey, mineral oils are thicker and move more slowly, making the engine thirstier and less efficient. Synthetics, however, get to work much more quickly, so the engine reaches peak operating efficiency that much sooner. What about synthetic blend oil? Synthetic blend oil is part synthetic oil and part conventional oil. It was created to counter the high price of pure synthetic oil, and imparts some of the benefits of synthetics into conventional oil, but at a lower price. The downside is that your vehicle won't reap the benefits of a fully synthetic product. A blended (semi-synthetic) oil is another choice that customers may make. What are the benefits of synthetic blend oil? An analysis of the differences between synthetic, synthetic blends and conventional oil by Valvoline, suggest that SOME of their blends (not all) offer benefits that approach that of a full synthetic in the areas of protection, cleanliness & horsepower, and other areas. Some provide anti-wear protection and better cold start protection that conventional oil. Some help minimize sludge and prevent deposit formation. Some are better designed for today's most advanced engines, and some contain special seal conditioners that rejuvenate engine seals to help prevent leaks. These advantages do not apply to all blends equally. This all means that if you choose to use a synthetic blend oil, you should choose which one to use carefully according to what benefits you are looking for. According to Valvoline’s information, if you are looking for an oil to provide help maintain fuel efficiency for the life of the oil, or provide excellent protection in extreme hot and cold temperatures, you should look at a FULL synthetic. For more detailed information, refer to the easy-to-read motor oil comparison chart found on the Valvoline website. Superior quality conventional (regular) motor oil is also available. If I just want to use conventional oil, what do you suggest? •	Improving gas mileage with the most commonly recommended grades by reducing friction. Our technicians do the job right! 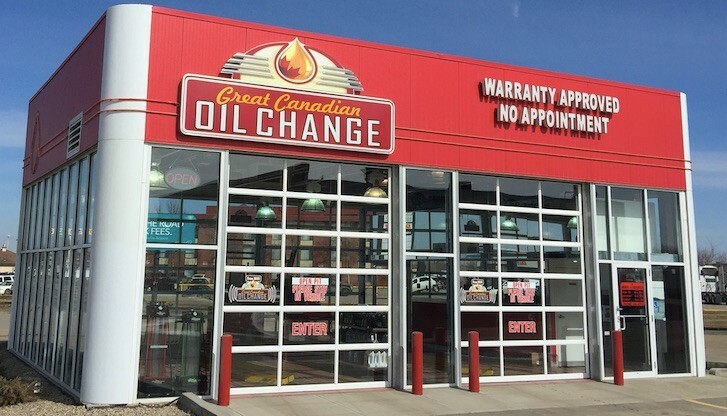 At Great Canadian Oil Change we offer a wide variety of oil products to meet your needs. We will recommend the conventional and synthetic oil products which meet your vehicle manufacturer warranty requirements and leave the choice to you. Visit the services page on Great Canadian Oil Change Regina’s website for a description of the quality Valvoline products we offer.